Synopsis (From Goodreads): One choice can transform you—or it can destroy you. But every choice has consequences, and as unrest surges in the factions all around her, Tris Prior must continue trying to save those she loves—and herself—while grappling with haunting questions of grief and forgiveness, identity and loyalty, politics and love. My Thoughts: Well! 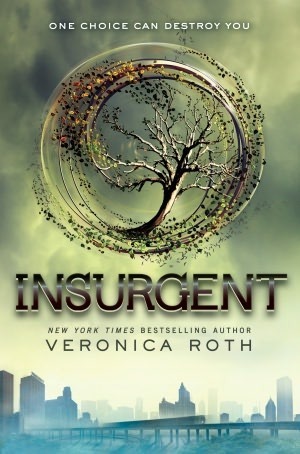 After feeling pretty meh about Divergent, I was quite impressed with the beginning of Insurgent. Unfortunately, the beginning is just about the most exciting part of the book. Am I being too harsh? Maybe. Maybe not. My main complaint with the first book was that the plot wasn’t following logical lines. Now, in books like this, it’s always good to try to suspend disbelief so that you can immerse yourself in the story – however, when there’s too much illogical mess going on, it breaks immersion because the readers is constantly furrowing their brows and wondering, “What the heck just happened and why would she do that when she knows we all know it’s not going to work and why it won’t work…” Yeah. I’m not a fan of spoilers, so I’m not going to go into each exact moment when someone does something so absolutely stupid and mind boggling that I just wanted to turn a couple pages and get on with the story…but they’re there. Lots of them. So…I’ve given this book a 2. I’ll bump it .5 because I’m feeling generous and I think that the -idea- behind the story was good. Roth just needed a little more editing time, perhaps.